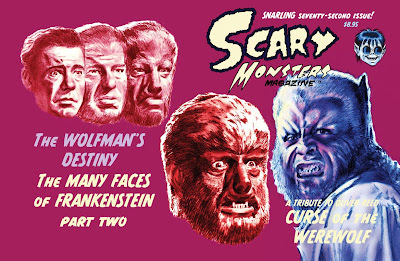 I've just finished the wraparound cover illustration for the 72nd issue of Scary Monsters magazine. For those who've wondered why this blog is "Scary Terry's World," -- this is why -- for more than a decade, I've been providing art for this mag, and since Scary and Terry conveniently rhyme, the nickname was inevitable! After years of painting these covers in acrylics on illustration board, pasting up copy on an overlay and shipping it all to the publisher in a big bulky cardboard box, I'm now experimenting with new ways to work, and making the final cover in Photoshop -- delivering the piece electronically. Yes -- I know it's a shock to some, but I'm digging this 21st century technology. 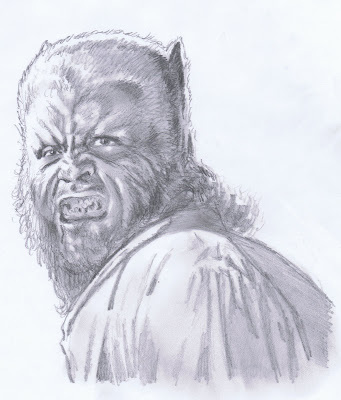 For this werewolf themed cover, I searched the web for images of Oliver Reed in the Hammer Studios movie, Curse of the Werewolf, and used a flopped version of a frame from the film for my preliminary drawing -- also referencing other stills and promotional photos for details. The Lon Chaney Jr. Wolfman images came from still-frame screen images. I started with pencil drawings on vellum -- shown here in their original black and white state. 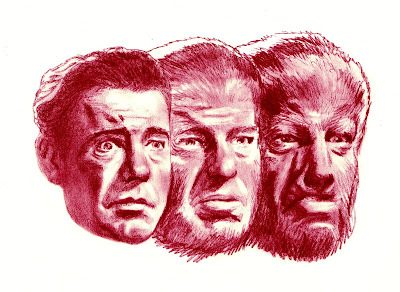 The next step was scanning them and playing with color and contrast in Photoshop. 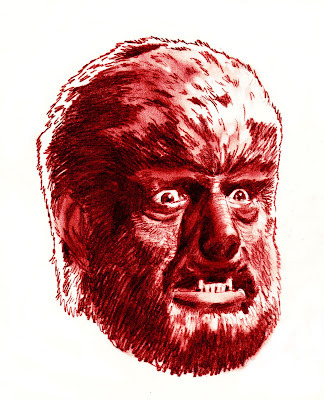 For Lon's Wolfman, I gave the linework a rich brown treatment, with a pale yellow in the highlights. For the Oliver Reed Werewolf, I went with a deep blue, and then using the airbrush tools, added pinks, purples, reds and yellows under the linework. The final step was to combine the images and add copy, logo and plug in the mag's mascot, Sam Scare. AWESOME!!!! 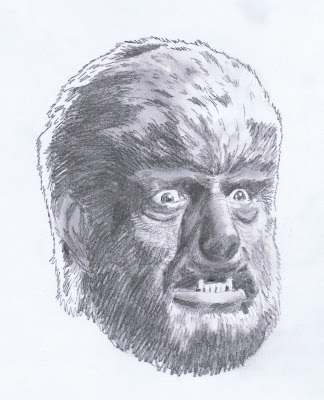 I'm the biggest Universal fan, ESPECIALLY the Wolfman! Gresat piece!! !